Road navigation company Rand McNally has announced the release of the 2018 edition of its Motor Carriers’ Road Atlas, an electronic and physical edition of a book featuring information for truckers as well as roadways within North America. According to Rand McNally, previous editions of the Atlas have been among the top selling atlases for truckers who drive over the road. Rand McNally reports that the 2018 Motor Carriers’ Road Atlas will feature road maps in addition to regulations pertaining to trucking and road features such as height clearances among highways. "Rand McNally has been at the forefront of innovation in the trucking market with an advanced suite of navigational devices and other in-cab technology," said CEO of Rand McNally, Stephen Fletcher. "Even as many professional drivers adopt technology to help them do their jobs – such as with electronic logging – most continue to rely on the Motor Carrier's Road Atlas as a quick reference and reliable back-up for navigation." In the latest edition of the Road Atlas, Rand McNallyreports that some of the most notable additions that drivers will find is information that pertains to the laws and regulations many drivers face regardless of their route. Rand McNally reports that despite the proliferation of in-cab technology used to guide drivers, the older generation of drivers who may have used physical maps to plan trips rather than digital mapping systems may find this edition's road atlas particularly helpful. 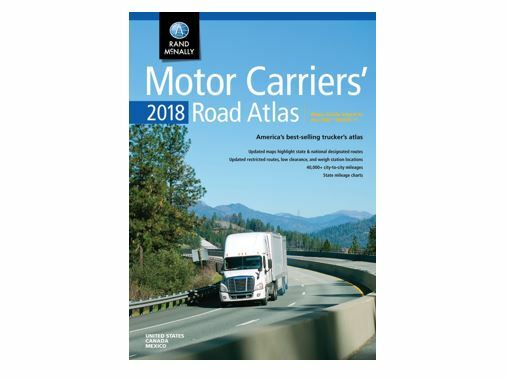 Rand McNally reports that the 2018 Motor Carriers’ Road Atlas will be available in many formats including digital copies available online and traditional copies available at several retailers across the country.